Maximizing efficiency, reducing costs and increasing profits are facts which will be always of high interest for companies. In the course of development of organizations different approaches have emerge to fulfill these interest. 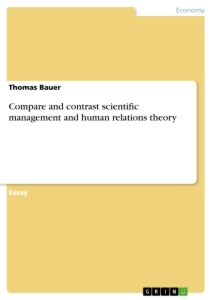 The purpose of this essay is to compare scientific management and human relations theory. The paper will start by explaining both schools of management. Differences and similarities will be discussed on the followings. With the help of these facts it can be shown how different these theories are and whether they achieve the same ends. Frederick Winslow Taylor was the founder of the scientific management (SM) also referred to as Taylorism (Thompson and McHugh, 2009, p.28). Optimize operational procedures and to implement the human recourse to be as effective as possible was the aim Taylor wanted to achieve. Therefore, it was necessary to change the existing proportion between management and workers regarding, who is responsible for the way the work has to be done (Thompson and McHugh, 2009, p.30). In the past the workers received their knowledge about working procedures from the previous generations or worked it out by themselves. However, there was no assurance if the way of doing the job was the most effective one (Thompson, 2003, p.31). To fix these problems and to make enterprises more profitable Taylor looked at the scientific side of establishments and developed four management principles. The first one is the principle of “developing a science for each element of work” (Thompson and McHugh, 2009, p.30). Within this principle Taylor summarizes the whole accumulated knowledge of the workers and the company. Hence, he creates rules and norms for each process. Furthermore, he divided the processes in small parts and analyzed them concerning their lead time and course of movement. As a result Taylor could identify and eliminate interference factors (Taylor, 1911, p.24). After these processes the second principle follows referring to the workers. Before Taylor developed this principle there was no selection or training of the workforce. Employees worked on their own and improved their skills and routines as good as possible. Now, a scientific based selection took place. Furthermore, the staff was exactly informed what they had to do and in which kind of way they had to do it (Taylor, 1911, p.36). Nevertheless, one problem was left and this was about motivation. Taylor named a number of different reasons, why the men worked very slowly and not as quickly as possible. This behavior was called “soldering”. One of Taylor’s explanations is the assumption of those men that if they work faster and maximize their output that this would finally lead to a reduction of the workforce (Taylor, 1911, p.13). However, the opposite is the case. Working faster means that the same number of people produce more goods. As a result unit costs decrease and the company can sell the merchandises to lower prices. Accordingly demand and also the profit rises and thereby the enterprise can pay higher wages to their employees. Resulting from this, Taylor implemented an incentive payment system to reward these workers who work more than others. Thus, he motivated the men in an economical way and reduced the might of the work-teams (Littler, 1982, p.55). The third principle is about “cooperation between management and the workers to ensure that the work is done according to the science” (Thompson and McHugh, 2009, p.30). This principle has two aims. On the one hand Taylor wants to achieve that the whole workforce follows the defined processes. On the other hand management and workers should work together. It is essential that both parties realize that it is more profitable for the company and their selves when they work hand in hand. Furthermore this is a key determinant to translate scientific management from theory into practice (Taylor, 1911, p.26). The relationship between men and management suffered another change referring work sharing. This is the topic of the final principle. In the past the workers themselves were responsible for every part of their job without support of the management. Taylor has changed this proportion. Collecting the whole knowledge of the workers, creating rules and regulations and form a science for each process was no duty for the men (Taylor, 1911, p.37). In other words the management had to ensure that each worker on each day knew exactly what he had to do how he had to do it and in what period of time (Taylor, 1911, p.39). Accordingly, this combination of work sharing and the change of the attitude to work are the factors for success of scientific management. The human relations theory (HRT) has evolved in the 1920s and 1930s (Grey, 2009, p.44). Studies by Elton Mayo at the Hawthorne plants of the Western Electric Company were the activator of HRT (Morgan, 1986, p.41). With the help of these studies the enterprise was able to analyze in which way the output of employees change due to diversifying the conditions of employment. Therefor, they established two focus groups which were exposed to different illumination levels. However, analysts noticed that the output in those test groups increased independently from lighting conditions (Pugh, 1990, p.345). Employees felt rather motivated by the particular attention they received. They got the feeling of being something special and not just a factor of producing products (Grey, 2009, p.45). In other words, only the actuality that workers were observed was the reason for this increased productivity. Furthermore, it demonstrates that the workforce can also be motivated by non economical factors. These non economical factors were the basic idea of the HRT (Thompson and McHugh, 2009, p.45). The HRT concerns with the aims, wishes and interests of the employees. Moreover, it supported measures to improve team work, cooperation between management and the workforce, internal communication and social relationships (Slattery, 2003, p.128). The idea was to create a social and friendly business environment to motivate the whole crew. Furthermore the employees should get in contact with each other to achieve a feeling of harmony in the organization. Development and integration of the workforce instead of oppression were further key elements (Slattery, 2003, p.128). These efforts pay off. Productivity and staff satisfaction increased. In addition the employees get a deeper relationship with the enterprise through a humanitarian working atmosphere. As a result, the informal side of the company is at least as fundamental as the formal side (Grey, 2009, p.46). However, the most difficult exercise was to transfer this theory into practice because the management had to change their view basically. Now needs and interest of the workers were in a particular focal point. Managers had received trainings in human relations that enable them to change the predominant business environment (Parker et. al., 1981, p.82). Accordingly the HRT has lead to principle changes in management, working conditions and in the organization as a whole. Frederick Taylor and Scientific Management. Influence on America during the "Gilded Age"
How useful is teamwork as a method of doing work?